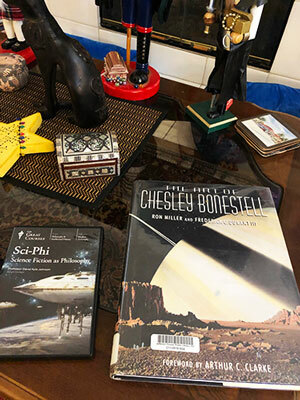 Palmia Observatory: Found: Art of Chesley Bonestell book; Non-redundant Masking to improve telescope resolution; Comet 46P/Wirtanen makes DSLR appearance; Cloudy night skies but great morning rainbow! Yes, the book was found tucked away in a bookshelf behind some astronomical equipment and now is readily available and we really enjoy looking at the art. In looking through the book, I found the original Amazon purchase receipt from 2014 and discovered that it was no other than Gravity Guy, Ken, who turned me on to the work of Bonestell. Thanks for that, Ken! Before getting into the main topics, we should mark two upcoming meetings on the calendar. First, is the upcoming 233th American Astronomical Society meeting in Seattle, WA on Jan 6-10, 2019. As a new amateur affiliate member I will be there and hope to see you all there as well! Next, for all of you interested in learning more and doing more in astronomical spectroscopy, you should check out and this spectroscopy workshop to your calendars. The second Sacramento Mountains Spectroscopy workshop will be held in Las Cruces, New Mexico on February 22-24, 2019. The workshop will cover the underlying principles and practical aspects of what equipment can be used. Wow, I would really like to attend this workshop, but unfortunately we will be searching for the northern lights at that time. If you are interested in the workshop then check out their webpage at: http://www.smswweb.com/. 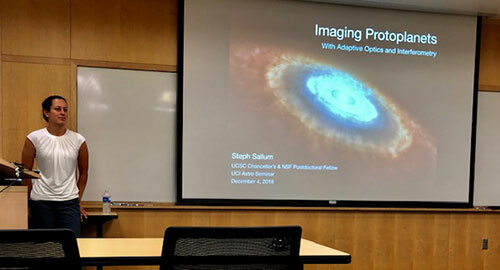 Ok, now its time to get back to UCI for an astrophysics seminar about imaging protoplanets by Dr. Steph Sallum, UCSC postdoc. Her presentation covered some of the details and findings about the development of planetary systems. The problem with trying to observe exoplanets is that hey are so far away and are so close to their star that it is difficult to resolve the planet's image. Now I had a harder time following the fast pace discussion of how measurements are made for all of the evolutionary stages of planet formation, from birth of the star itself from the collapse of a molecular cloud, which continues to form a disk which then can form planets. But what I was most intrigued by was the technique used to increase the resolving power of telescopes so that the small fine details of the planetary disk can be observed. We are talking about milli-arcsecond resolution in the optical and IR wavelengths. We know that in radio wavelengths the very large arrays of telescopes can be operated as interferometers with very long baselines to achieve very high angular resolution, but the approach described by Dr. Sallum was of Non-redundant Masking (NRM), which is used in optical telescopes. Thanks for that, Dr. Sallum! Astronomers including amateur astronomers use a somewhat similar technique, like speckle interferometry, to increase the optical resolution of telescope measurements to enable the separation of closely orbiting binary stars. The concept of NRM, at first sounds completely counterintuitive. The approach is to block off most of the light coming into a large telescope and only let light through a few small apertures. Check out this approach, now proposed for the James Webb Space Telescope. So you go to all the trouble to build this large mirror and now for some types of observations, you only let light through to the camera in only a small number of locations. Then by comparing the light from separate pairs of these small apertures, the seeing and resolution can be increased and this technique allow ground based telescopes to have higher resolution than that of the HST. Pretty neat! This approach only works for bright objects, but the resolution of the telescope is made much larger. 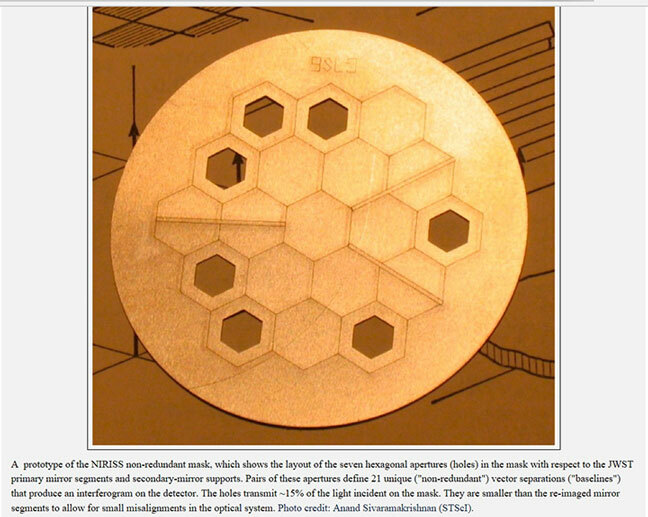 The proposed filter wheel for the JWST is shown below. 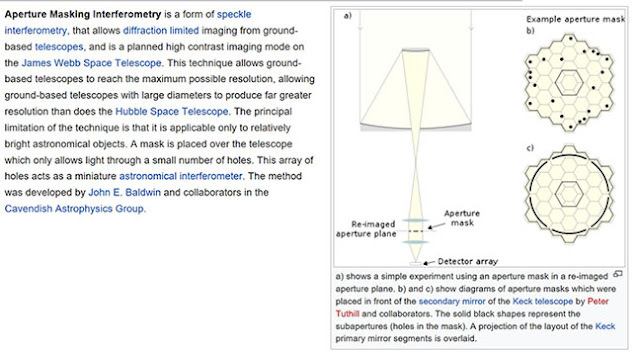 The mask has seven holes which let much less light though than that collected by the whole mirror system, but the increase possible in angular resolution is worth it for many bright objects. So, I still don't quite understand all of it, but the results seem quite impressive. We will have to work through more of the details. Ok, my head hurts, so let's actually do some nighttime observing. Finally, on the astronomical observing calendar, we received the monthly Sky Wire by OC Telescope, and it mentioned that Comet 46P/Wirtanen will make its closest approach to the sun on December 16 and should be naked eye visible at that time. Well, just to see what could be seen right now, it was time to pack up the DSLR and tripod and go outside an take a look! It was going to be tonight, or wait for a couple of days for the storm to move through. 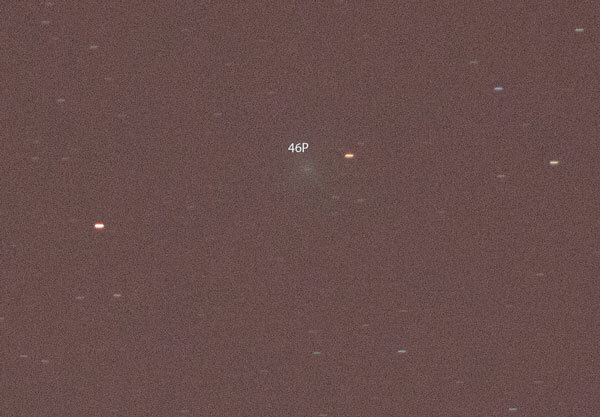 To find where to point the DSLR, I used Sky Safari Pro to identify where 47P was located. At the time of observation, the comet was located at about 180 degrees south and just about 2 degrees lower in altitude than is the bright star in Orion, Bellatrix. So, pointing the camera in the right direction was pretty straightforward. Any bright enough star to be seen in city lights would have worked, but Bellatrix was the closest one to where the comet was supposed to be. The 150mm, 8 second, image below, taken in city lights on a non-tracking tripod shows just a dim blue glow. 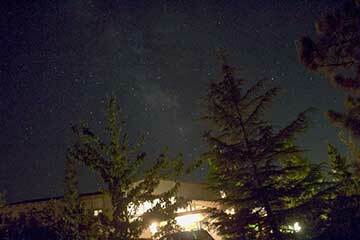 Longer exposures resulted in more streaking and the ISO was already set quite high at 3200. To confirm the image above is really that of Comet 46P, the image was submitted for astrometric analysis. The published coordinates for 46P were: RA = 02 49 and Dec = -12 27. As you can see from the astrometry report, the center of the image is pointing at: RA = 02 54 and Dec = -12 38. So my eyeball pointing method worked out to be pretty close and the target comet is close to the center of the camera frame. Ok, the weather forecast for the next couple of days is supposed to be poor for astronomical observation, so it is good I was able to get at least one shot of Comet 46P/Wirtanen. When the weather clears up my observing plan is to first take out and set up a tracking mount for the DSLR in order to try and capture any tail in the image. Maybe we will have to schedule some time at a darker site if that set of images looks more promising. Anyway, we know the story about how clouds are always getting in the way. But, one piece of good news about clouds is that sometimes they come with rainbows. 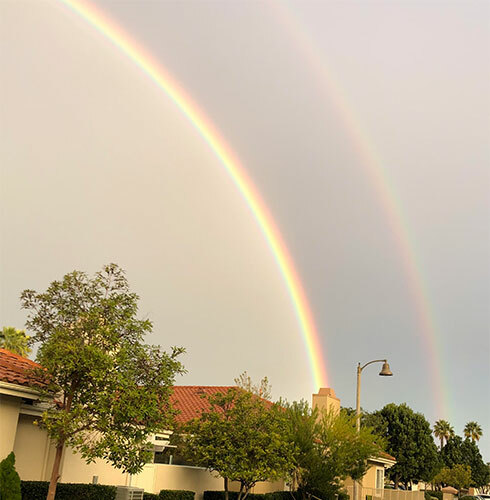 It turned out in the morning after the comet image was made, a beautiful double rainbow image showed up. I saw a strange morning glow outside the windows and went out with just my PJ's and iPhone and experienced this wonderful rainbow!